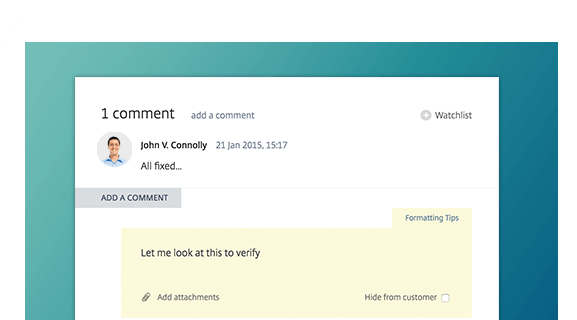 Share announcements about your services with team members and customers. When you provide support, it’s smart to keep a record of what he said or she said. In Service Desk, every message and comment is stored in their associated service or incident for you to view. That way, nothing slips between the cracks, and you have clear documentation of your communication with customers. Publish a message. Add a comment. When there’s an update or issue with one of your services, you can easily let everyone know by posting a message. You can publish these internally to just your team or externally to the customer portal. People can then comment on the post to share feedback or ask questions, and you can reply back just as easily. Your online support portal is a hub where customers can talk with your team. 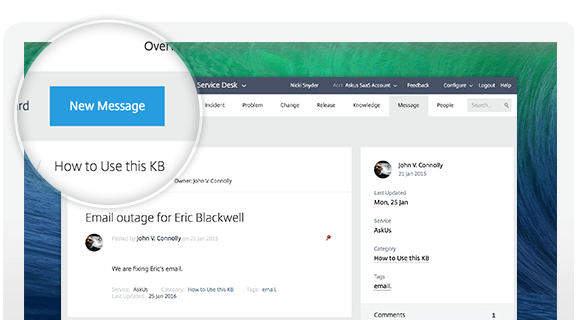 Service Desk incorporates messaging into every incident record, so the conversation stays in the context of the help request. And whatever service announcements you make appear immediately in the portal for customers to see. Mistype a word? Have new information to add? You can easily edit your messages in Service Desk. Customers can do the same with their comments, but they have a 15-minute window to get their edits in or delete it entirely.